Yesterday’s match-up was seen as the irresistible force meeting the immoveable object. The Black and Gold’s best in the league offense being the force while Denver’s top ranked defense being the object. At halftime, it appeared the immoveable wouldn’t be budged. Then the force awakened in time to see the Pittsburgh Steelers rally for a thrilling comeback victory over the Denver Broncos 34-27. You won’t see two halves of football more polar opposite than what we saw yesterday. Whatever game plan defensive coordinator Keith Butler drew up prior to the game he’d best leave in the trash compactor because it failed spectacularly. Safety Will Allen, who had a strong game that could’ve been epic if not for taking receiving lessons from Ike Taylor, forced a fumble on Denver’s second play of the game. DeAngelo Williams plunged in a few plays later to give the Steelers a quick 7-0 lead. From that point on, it was all Broncos. Their next three drives in a row ended in touchdowns. And they scored them in all different ways. The first was a long 12 play slog where Brock Osweiler kept completing passes on third down to move the chains. The second was an embarrassing blown coverage which allowed old friend Emmanuel Sanders to run wide open down the field for a 61 yard bomb. A 10 play march down the field put Denver up 17 with a late field goal by the Steelers cutting the margin to 14 going into halftime. It’s impossible to imagine the defense playing any worse than they did in the first half. The secondary was in some sort of soft zone designed to prevent big plays which is fine except Denver receivers didn’t have anybody within five yards of them. Manny Sanders, something of a disappointment here in Pittsburgh, ended up posting 10 catches for 181 yards primarily against this defense. With no pressure on the young padawan Osweiler and huge windows to throw at, Denver’s offense couldn’t be stopped. Meanwhile, the Steelers vaunted offense couldn’t get on track. Ben Roethlisberger threw a pick two drives after the early touchdown and their other two drives ended with field goals after bogging down. Williams (14 carries 26 yards) was a total non-factor. Denver’s secondary did successfully prevent the big play with a 23 yard reception the longest completion all afternoon. 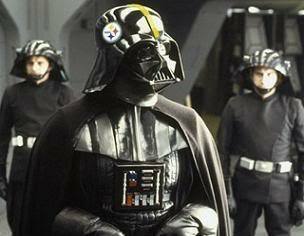 What they weren’t ready for, however, was the firepower of the Steelers fully armed and operational battle station offense. If the first half was the prequels, the second was the original trilogy. The defense started playing tight, challenging receivers and forcing mistakes. Osweiler was under constant siege, leading to bad throws and one pick that could’ve easily been two or three. The Steelers also got help from Denver receivers Demaryius Thomas and Vernon Davis, who both dropped key passes at key times. While the defense was finding second gear, the offense made the jump to light speed. Abandoning any pretense of a running game, Ben started picking apart the vaunted Denver secondary with scary precision, finishing with 3 TDs and 380 yards. Martavis Bryant (10 catches for 87 yards) and Markus Wheaton (6 for 62 and TD) made some plays but it was really the Antonio Brown show. AB finished with 16 receptions (!) for 189 yards (!!) and 2 TDs (!!!). You can’t stop him, you can’t even contain him. AB will get open and Ben will find him. When the fourth quarter stared with the Steelers driving, you could feel it coming. The Steelers converted a third down when AB caught a short slant and broke one tackle before hurdling another on his way to a first down. A few plays later Wheaton caught another short pass and broke two tackles on a mad dash to the end zone. Not only are the Steelers receivers the best in the league, they’re probably the strongest. Denver kept them from going deep but it didn’t matter because time and again one of our wide outs – usually AB – would break through a tackle (or two or three) to turn a short gain into a long one. Osweiler had the ball and a chance at a game-winning drive with five minutes left when the relentless Steeler blitz finally got to him. He actually escaped two would be sackers but it worked out for the best because he never saw Ryan Shazier dart in front of Sanders for a perfectly timed interception. It took only three plays for Ben to hit AB with a STRIKE splitting two defenders and never breaking stride into the end zone. The defense held tough, getting Denver to turn the ball over on downs but Denver was given a second chance when Ben threw a really bad pass trying to hit Williams for a game-sealing first down. I have NO issue with the Steelers throwing there as the Steelers had no chance of running for a first down. A three and out would’ve given the Broncos the ball back with about 50 seconds left and no time outs. Well the chances of pulling the game out would’ve been slim, it has happened. As has been famously said, I would rather play to win the game. Or in Tomlin-speak, I prefer to live in our hopes, not our fears. And those hopes were well-founded when the much maligned defense forced a second turnover on downs to ice the game away. With the win, the Steelers leapfrog the Jets for the 6th seed in the AFC playoff picture. If both teams win out, the Steelers get in via tiebreaks so our destiny is fully in our control. Not only that, the Steelers are easily the hottest team in the league right now. The Force is strong with them.